The Okavango Delta is one of the most sought after wilderness destinations in the world, and it’s not hard to see why. With a river flowing inland rather than out to sea, lions that swim and more elephants in one place than anywhere else on earth, the Okavango Delta promises a unique and unforgettable experience with each return trip. Each year, the cycle begins in the Angolan Highlands. 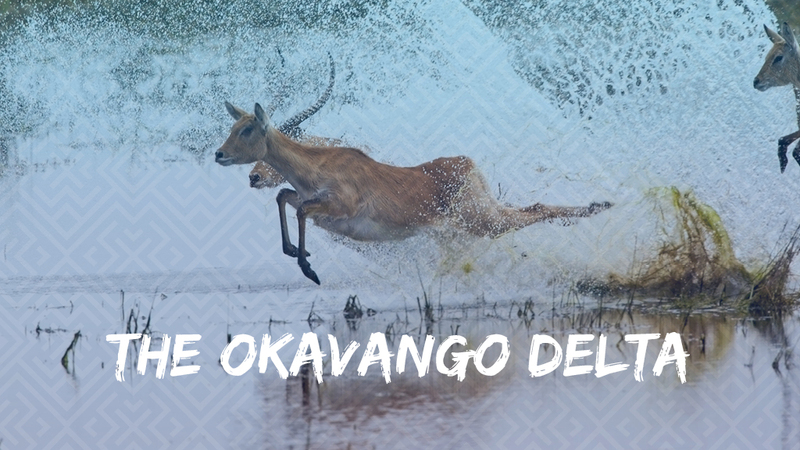 The Okavango (or Kavango) River flows from Angola, across Namibia’s Caprivi Strip and into the Kalahari Desert in northern Botswana. Every year, approximately 11 cubic kilometers (11 000 000 000 000 litres) are discharged from the Kavango River in the Okavango Delta. About 60% of this water is lost to transpiration by plants, 36% is lost due to evaporation, roughly 2% is percolated into the aquifier system and the rest flows into Lake Ngami. The flood waters from Angola reach the Delta between March and June and peaks in July. This coincides with Botswana’s dry season and creates huge migrations of game, resulting in one of the last remaining great wildlife ecosystems in Africa. The floods trigger a transformation, turning the dry and arid desert into vibrant wetland, humming with life and activity. The Delta is home to 1061 varieties of plant species, 89 kinds of fish, 64 reptile species, 482 different types of birds and 130 species of mammals – some of which are the tourists’ main attractions, including endangered species such as cheetah, lion, white and black rhino, African Wild Dog, the Wattled crane. Large herds of elephant, buffalo, zebra and red lechwe migrate for weeks over the Kalahari Desert to reach the abundant wetlands. Lions are found in most areas of the Delta, including swampy areas where you would not expect cats to be. The lions of the Okavango Delta dispute the theory that lions don’t like water. When the flood is at its peak, dry land is, for the most part, restricted to islands and the lions need to swim from island to island to hunt, which they do readily. This adaptation is even influencing the evolution of lions. The great deal of time they spend in the floodplains and in the water means they have generally stronger forequarters than other lions. Prides in the Delta have more developed forequarters and appear larger than their African counterparts from all the swimming they do. The Okavango Delta is truly one of the last remaining Edens on earth. In 2014, the Okavango Delta became UNESCO’s 1000th World Heritage Site, which has not only aided tourist inflow but has also helped to protect this unique ecosystem. The Delta has never been subject to significant development and remains in pristine condition. Tourism is limited to non-permanent tented camps and all facilities are monitored to have minimal ecological impact. The Okavango Delta will delight and astonish you, a once-in-a-lifetime destination that you will want to return to again and again. The Delta is a place to experience nature in one of its purest forms, a place to experience Africa’s true Eden.